Home > Aminoace Co., Ltd.
Mire Biscuits are among the most popular and best-known locally made snack foods in Kochi. They are made by frying a hard biscuit in oil. 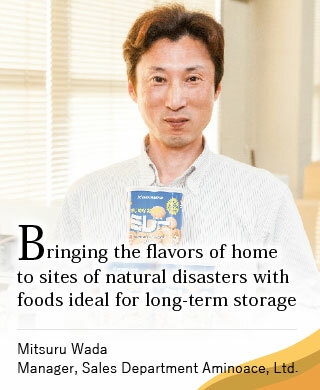 The biscuits can be stored as an emergency food because of their long shelf life， and can be canned to achieve an even longer storage period. The company has purchased canning machinery， and the product has passed a stress test performed at the Industrial Technical Center. We have succeeded in making a product with a five-year quality guarantee. Mire Biscuits are often purchased by nursery schools and other facilities， as well as by individuals. Mire Biscuits have a very familiar flavor that makes you comfortable eating them. They do not contain eggs， butter or milk， so children with egg and milk allergies can safely eat them. The company is committed to providing food that is soothing and helpful for people， particularly at times of natural disaster.